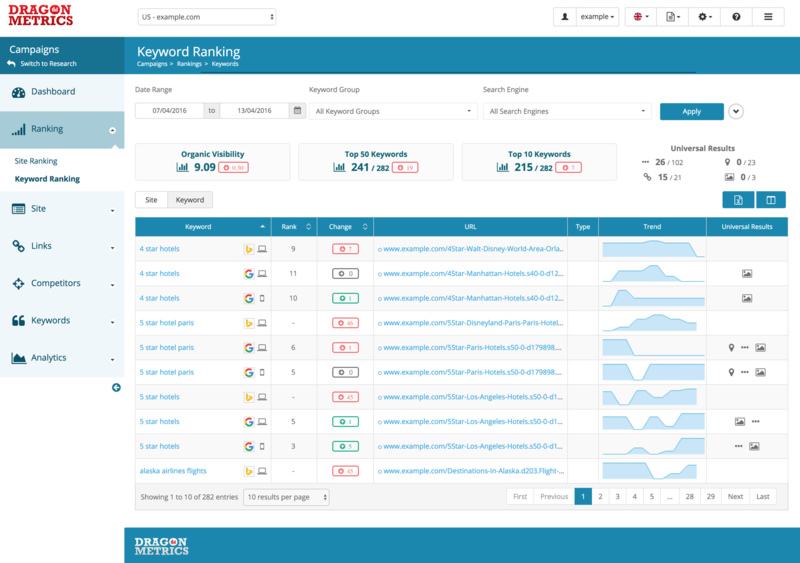 Keyword Ranking Performance page allows you to dig deep into your ranking data, you can assess ranking performance for each individual keyword, compare them across multiple search engines, region or devices, analyze your ranking URLs and which result types are you ranking for. If you want to access your campaign's overall ranking performance at a glance, access our Site Ranking page. 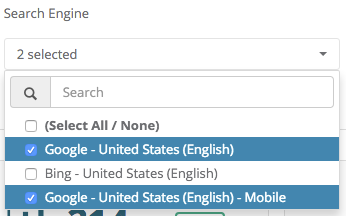 Read this FAQ if you are not sure about how to track keyword rankings in Dragon Metrics. At the top of the page you’ll be able to choose what criteria of data you want to show, you can segment your data with different timeframe, keyword group, search engine and much more with our keyword filters. Changing any of these will update all of the data you see on the page. At the top of the page you’ll be able to choose what criteria of data you want to show, you can segment your data with different timeframe, keyword group, search engine and much more with our extensive keyword filters. Changing any of these will update all of the data you see on the page. Weekly updates - Since we update rankings at the same day every week, the minimum interval you can view and compare ranking data with the date range selector is from one week to another. So for example in your weekly rank tracking account if you choose to show data from 01/04/2016 to 07/04/2016, you will be presented with data of one of these days depends on your account's update day of the week, but not every single day. Daily updates - You will be able view and compare data with the minimum interval of days, for example in your daily rank tracking account if you choose to show data from 01/04/2016 to 02/04/2016, you will be presented with data of both of these days. 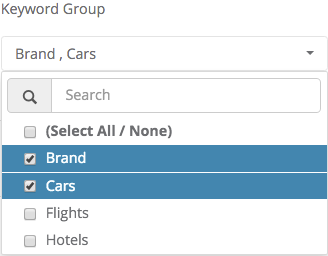 If you've multiple keyword groups in your campaign, you can choose to show keyword data for one or more of these keyword groups with the Keyword Group selector here. 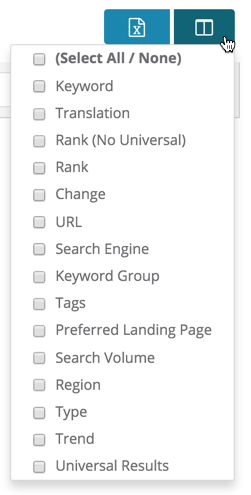 Clicking on the Search Engine selector will show a list of all the search engines you are tracking in Keyword Groups you've selected in the Keyword Group selector, you can select single or multiple instances of them to view data for any combinations of tracked search engines you'd like. After selecting what data you'd like to view, click on the Apply button and Dragon Metrics will do the filtering for you. Right below the filters, you will see a row of callouts showing your selected set of keywords's highest level summary. This callout shows the Organic Visibility for your chosen site in your selected set of keyword, Organic Visibility is a single number representing how well your keywords are ranking. You can think of this number as the average expected click-through rate of all keywords in the current set. Learn More about Organic Visibility. 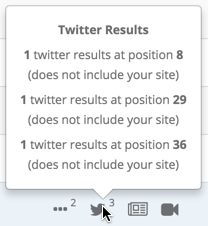 In the little box next to the number is the change in Organic Visibility of your site compared to last period. Learn more about Organic Visibility. This callout The number of keyword ranking in the Top 50 positions / The total number of keywords in this selected set of keywords. The change in number of Top 50 keywords compared to last period is shown in the little box as well. Similar to Top 50 Keywords, the Top 10 Keywords callout shows the number of keyword ranking in the Top 10 positions / The total number of keywords in this selected set of keywords. 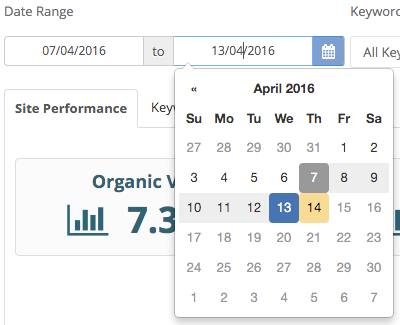 The change in number of Top 10 keywords compared to last period is shown in the little box as well. The Universal Results callout will show you the number of universal results we've found for each major results types and how many of these universal results belongs to your site. Scroll down and you will see the keyword ranking chart, there are a lot of data you can choose to show in this chart, and the image above've shown the most common data points. Search Volume - This column shows the monthly search volume of the keyword, search volume for keywords can added through keyword management.